Mark Stephen “Markie” Glassel, 63, of North Branch, Minnesota, passed on to Heaven on April 7, 2019, after succumbing to pneumonia and its complications. Markie was born July 1, 1955, in St. Croix Falls, Wisconsin, to Lester and Sigrid (Larson) Glassel. Born with cerebral palsy, Markie lived with his family in St. Croix Falls, and Chisago City, Minnesota, until he was eight, after which he lived at Cambridge State Hospital and Trevilla of Robbinsdale. 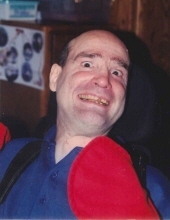 In 1993, he moved to the foster home of Butch and Joy Karcher, and for twenty-six years he was lovingly cared for by his Karcher Foster Services family at three different locations, most recently at Ponds House, North Branch. Markie graduated from high school in 1976. He worked at the Chisago Lakes Achievement Center in the recycling and packaging departments for many years before retiring in 2011. Markie brought joy to others through his passionate enthusiasm for everything from cars, animals, and professional wrestling to the Six Million Dollar Man and superheroes. Although he couldn’t speak in sentences, he communicated his delight with gusto using his signature scream, his infectious smile, his expressive eyes, and his rambunctious right leg. He always loved a fun party; many friends attended his sixty-third birthday bash, which included a petting zoo and a visit from Wonder Woman. Preceded in death by his parents, sisters Esther Lee and Ruth Grace (Joey Ray), and niece Acacia Brist, he is survived by his remaining siblings—Lois Joy (Gunter) Hofmann, San Diego, CA; David, Spring, TX; Daniel (Dee), Willis, TX; Loretta (John) Ekdahl, Willis, TX; Timothy (Jeanette), New Waverly, TX; Jonathan (Bonnie), Huntsville, TX; and Rebecca Hope, Champlin, MN—and many nieces, nephews, cousins, and friends as well as his foster family—Butch and Sara Karcher and the staff of Karcher Foster Services—and his pet rabbit, Batman. The family requests that gifts be directed to Karcher Foster Services for construction of a memorial at Ponds House. Everyone is invited to Trinity Lutheran Church immediately after the service to celebrate Markie's life and for a time of sharing and celebrating his life. To send flowers or a remembrance gift to the family of Mark S. Glassel, please visit our Tribute Store. "Email Address" would like to share the life celebration of Mark S. Glassel. Click on the "link" to go to share a favorite memory or leave a condolence message for the family.